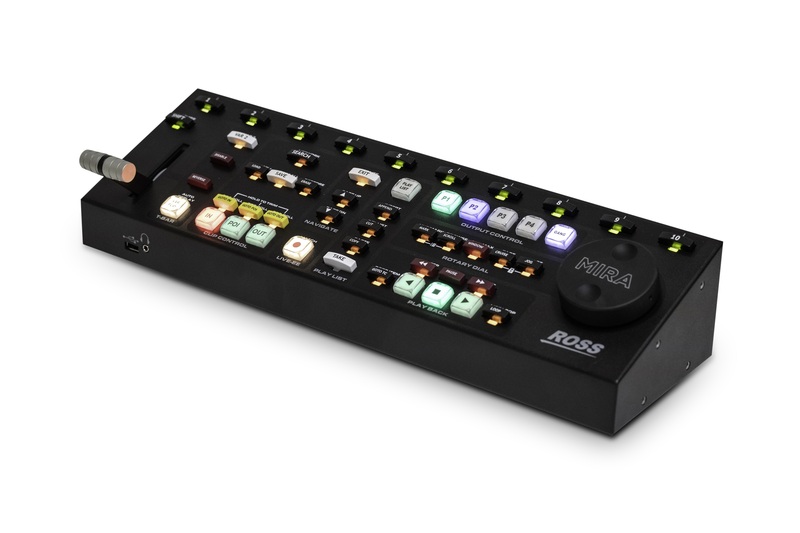 Ross Video (Booth SL1805) has announced improvements across its Abekas line of replay and video servers. Customers now have access to new channel configurations, new media-storage capacities, and new codecs — all at a price lower than before. Ross Video’s premium Mira replay server has been rebranded Mira+. On the Mira replay side, the premium Mira server has been rebranded Mira+. The systems fitted with AVC-Intra hardware are now offered in 6-, 8- and 12-channel models. In addition, Mira+ media-storage capacity is increased to 280 hours or 580 hours. The economical Mira Express replay system remains unchanged, providing the same affordable 4-ingest/2-playout functionality as before. Meanwhile, the Mira Control Surface has a new look that draws inspiration from the Carbonite Black and the same functionality as before. Another noteworthy feature now available on the Mira+ and Mira Express replay systems is the MiraTouch control interface. The Dashboard-based system provides touchscreen control tailored to live horse-racing productions, with additional sports coming soon. On the Tria video server side, the premium Tria server has been rebranded Tria+, and the video servers fitted with AVC-Intra hardware are now offered in 4-, 8- and 12-channel models. In addition, media storage has been increased to 40-, 80- or a massive 580-hours of capacity. The Tria Express clip server now supports the AVC-Intra codec, which is a much better fit for modern, file-based editing workflows. Tria Express with AVC-Intra also accommodates 1080p video formats, dramatically improving image quality of fast-moving content presented on large in-venue displays. Both the premium Mira+ and Tria+ servers have been upgraded with a new high-performance motherboard that vastly improves overall server performance. The motherboard also adds 10-Gigabit Ethernet connectivity, greatly enhancing Growing File Export capability. Mere seconds after live capture, MXF media files from recording inputs can be continuously written to a NAS, with all files accessible by active edit bays. Perhaps most important, prices have been substantially reduced across the entire Tria and Mira product lines. Customers of the premium Plus-class servers get more power, more channels, and more storage – for less. Meanwhile, the server functionality of the Express-class product lines is more affordable than ever. The newly revamped Mira+ and Tria+ systems are available for order now, with shipments beginning in June.